← Who has Kat's helmet and boxing gear? Urgency: DVD release in November? It’s been more than two months since the last bit of news about Luciana’s upcoming movie – independent thriller Urgency. Contrary to what we heard earlier this year, Regent Films obiously didn’t release the movie by the end of summer, and we still don’t have an official release date. So imagine my surprise when I stumbled over the release schedule of Australia-based distributor Peacock Films. 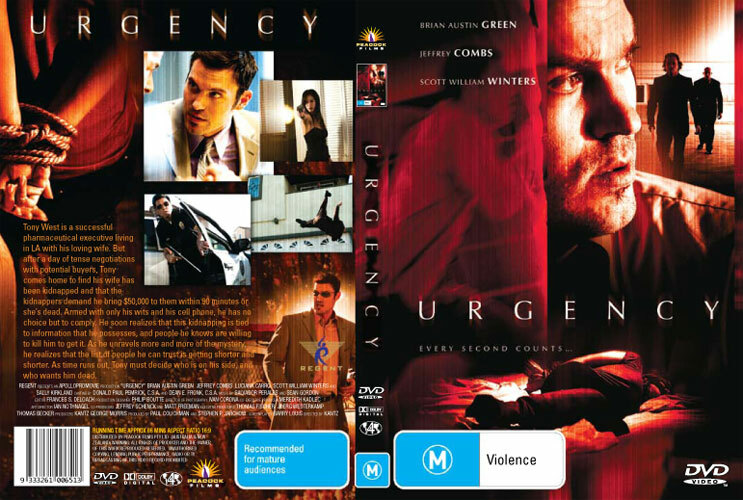 Apparently, Urgency will be released on DVD (Region 4) in November. Finally! The year-long wait is almost over! Let’s hope we’ll soon here about releases in Region 1 (North America) and Region 2 (Europe), too. Obviously, we would have loved to see her face on the DVD jacket, but a DVD cover featuring Luciana is pretty cool nonetheless. Please note that she’s billed third, right after fellow genre veterans Brian Austin Green (“Terminator: Sarah Connor Chronicles”) and Jeffrey Combs (“Star Trek”, “The 4400”). Apart from short Passageway, this is Luciana’s best billing to date. Tony West [Green] is a successful pharmaceutical executive living in LA with his loving wife [Luciana]. But after a day of tense negotiations with potential buyers, Tony comes home to find his wife has been kidnapped and that the kidnappers demand he bring $50,000 to them within 90 minutes or she’s dead. Armed with only his wits and his cell phone, he has no choice but to comply. He soon realizes that this kidnapping is tied to information that he possesses, and people he knows are willing to kill him to get it. As he unravels more and more of the mystery, he realizes that the list of people he can trust is getting shorter and shorter. As time runs out, Tony must decide who is on his side, and who wants him dead. Just a few more weeks, gentle readers! This entry was posted in Other and tagged DVD, Fast Track, Film + Television, Urgency. Bookmark the permalink.